Though nutrition can be highly personalized, one thing most of us share is the urge to let loose every now and then. Whether that’s a couple of slices of pizza on a Friday night or an ice cream cone on a hot summer day, sometimes the call of the craving is just too hard to deny. Whether giving into these cravings helps or hurts you in the long run is largely a matter of how you approach it. So, I turned to the pros — nationally recognized registered dietitians — for the top do’s and don’ts for staying in control of cravings. To avoid eating monstrous portions of your favorite foods, try a small version every day and take the time to enjoy it. In other words, let go of the guilt and return to healthier choices at your next eating occasion. One indulgence won’t make or break a mostly healthy menu. “While I’m not a fan of the word ‘cheat,’ I think it’s perfectly fine to occasionally indulge. Just do it smartly. Choose one thing you really want, whether it’s ice cream or a pina colada, but don’t give yourself excuses to turn the one indulgence into a whole day or week of overindulging!” advises Amy Gorin, RDN, owner of Amy Gorin Nutrition in Jersey City, NJ. Another way to look at this: Have the French toast at brunch, but then steer yourself toward a luscious seasonal salad at your next meal. After all, when you drop your smart phone and crack the screen, you don’t take the next chance to hurl it across the room. Apply that thinking to your menu. Have what you want, but don’t turn it into all-day cheat fest. If you know you’re heading to happy hour or Sunday brunch with friends, it’s helpful to plan smartly. You want to spend time with friends, not wolf down the first thing you see — and everything else in eyesight. If I’m brunching at 11 AM but I’ve been up since 8 AM, I might munch on a banana or a bowl of berries before heading out. That way, I can make better choices from the menu, opting for, say, avocado toast with a poached egg instead of a stack of pancakes with whipped cream. An invitation to happy hour might call for a small piece of cheese with some sliced peppers or a side of grapes, allowing me to share the heaping plate of nachos rather than dine on them solo. And speaking of happy hour, remember that booze lowers your inhibitions so stick with one beer, glass of wine or low-sugar cocktail so that you stay in charge of your choices. The best food to conquer a craving is the food you are craving. I view cooking and eating as an act of love. It’s a beautiful expression to cook someone a meal or break bread with friends. This translates well to the concept of mindfulness and allowing yourself to eat foods you love. In other words, having a fresh, hot, small batch doughnut — a personal favorite of mine — on rare occasions is treating myself with loving kindness. Having one each day is not a loving act, since it isn’t treating myself with care. This example also illustrates what most dietitians know — that some treats are totally worth it, while others are just ‘meh.’ If you’re going for it, make sure it’s worth it! I think the best food to conquer a craving is the food you are craving. Have a hankering for something chocolatey? Or maybe you’re craving something cheesy or creamy? Take note of what it is you’re really after and then try a subbing something that provides some of the same qualities, suggests Jackie Newgent, RDN, a culinary nutritionist In Brooklyn, NY. “These grilled hummus quesadillas make a delightful and satisfying pick in place of their extra-cheesy counterpart,” she says. This is my way of both having a plan and getting back on track. If I know I’m heading to a restaurant or party, I’ll eat lighter meals both before and afterwards. If lunch is particularly heavy, I may not need a snack that day. And I’ll stay tuned to my body — when it’s hungry and when it’s full — so that I’m naturally managing portion sizes of my not-so-healthy meal. I’m not talking about being restrictive here. It’s more about being mindful of your choices. For me, that means if I have more French fries than normal, I balance that out by eating heaps of in-season produce in the form of a satisfying salad, layered with whole grains and quality proteins. I take this to heart by enjoying a small bit of dark chocolate or a favorite frozen treat each day. Andrews offers her Carrot Cake Cookie Sandwiches as another example of a small but super-satisfying goodie. If blondies are your thing, Sara Haas RDN, LDN, Chicago-based Culinary Dietitian suggests whipping up a batch of her White Chocolate Chip Blondie Sandwich Bites. Not only are they sized just right, but they’re also made with some whole wheat flour — a touch that brings some nutrition to the party. And who can resist The Best Banana Pudding served in small, individualized mason jars? Rather than denying yourself, most RDs suggested enjoying small treats that won’t derail your healthy eating goals. Dawn Jackson Blatner, RDN in Chicago, IL has what I think is one of the best pieces of advice! “Eat what you crave, just make it with wholesome foods instead of overly processed C.R.A.P. (Chemicals, Refined sugar and flour, Artificial stuff, Preservatives). Tacos! Pizza! Ranch! Sweets! All our favorites have a superfood version!” I could not agree more! Her Superswap Strawberry Shortcake recipe is a great example of how to enjoy a family favorite. And try these smoothies and ice creams with real food ingredients. “My Chocolate Chunk Blueberry Smoothie takes less than 5 minutes to make and satisfies my craving for a frozen treat in a healthier way,” says Bannan. Gorin’s no added sugar banana-based “nice cream”also fits the bill. You’ll see that each of these pack in produce, which boosts the nutrition factor considerably. And though it has a touch of sugar, McMordie’s Homemade Roasted Strawberry Ice Cream is a fresh, wholesome version that will win you over. Ingredients:6 cups popped popcorn Pink food spray* 1/2 cup pink candy melts (we used cotton candy flavoured melts) 1/2 cup blue candy melts 1-2 teaspoons coconut oil or shortening Pink and blue sprinkles *NOTE: if this isn’t available near you, you can add a couple drops of red food colouring to 3 Tablespoons of melted coconut oil and toss the popcorn in a bag with the dye to get the same pink effectDirections:Pop the popcorn with an air popper. (Or use plain bagged popcorn for ease – no butter popcorn.) Lay the popcorn on two cookie sheets and spray lightly with the pink food spray. Turn over and coat the other side. Let dry as you prep the candy melts. Place the candy melts each in a small microwave-safe bowl. Heat for 25 seconds, stir, and reheat as needed. Add in 1/2 teaspoon or more of coconut oil to make the candy melts more loose and easily drizzled. 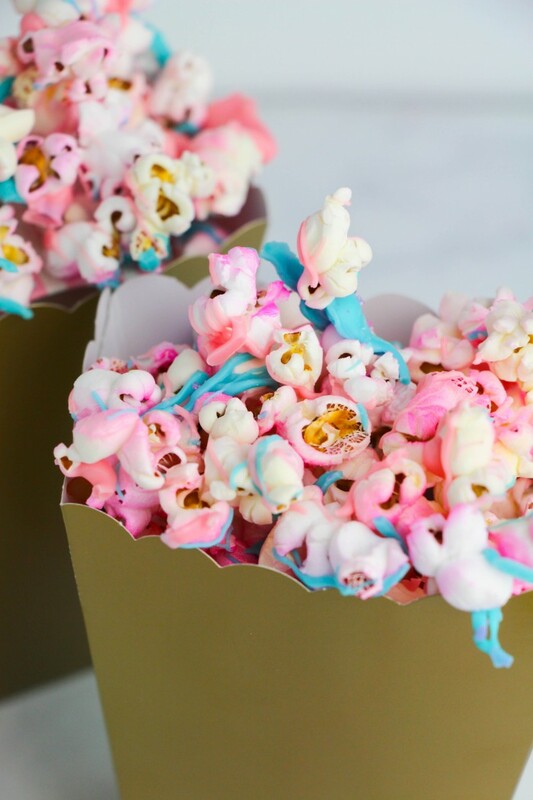 Drizzle half of the candy melts over the popcorn, add sprinkles, let dry. Reheat the candy melts and toss the popcorn to coat the other side with the second drizzle. Let dry completely before serving or packaging. These Apple Swirls are a perfect little treat ready for any occasion!